At SIRCLO, we are determined to realize successful online businesses. We make sure that everything we do is heading there. We are a relatively small but growing team. It is our dream and duty to cultivate e-commerce potential in Indonesia. We are present to bring the solutions to help people build their own professional online stores which are reliable and attractive with ease. With SIRCLO online stores, business owners gain the opportunity to manage their business integrated and supported by surrounding services to succeed. We value your qualification and the complexity of your work according the industry where we are in. Imagine a workplace where you are devoted to experiment and implement new ideas. That is us! Focus on high-end performance web UIs. Redesign UIs and Implement new UIs. Experience with server-side web frameworks such as Ruby-on-Rails, Django, or Node.js. Significant development experience in Angular, React.js, ember.js, backbone.js or similar. Experience/interest in other technologies we use - see other positions for details! S1/Bachelor's degree in Computer Science, similar technical field of study or equivalent practical experience. Open to exploring, learning, and implementing new technologies and concepts. Understand relevant software engineering and computer science concepts. Experience with server-side web frameworks such as Ruby-on-Rails, Django, Laravel, or Node.js. Experience/interest in some or all of the following tech: Linux system administration, Amazon Web Services, Fabric Python, Ansible, Consul, Docker, Apache Kafka. Experience/interest in DevOps practices is a plus. Experience/interest in other technologies we use is a plus - see other positions for details! Able to work on-site full-time in our main office in Jakarta Pusat. Develop and maintain modules for Odoo/OpenERP. Manage individual module priorities, deadlines and deliverables. Work closely with frontend engineers to implement design solutions. Experience in developing solutions using Python. Experience in developing solutions for Odoo/OpenERP is a plus. Experience and understand API, including design & integration. Open to explore, learn and implement new technologies & concepts. Build design strategies and communicate design rationale to relevant parties. Translate business and user requirements into usable and highly effective design solutions. Create low to high fidelity wireframes, user flows and prototypes to communicate ideas to multiple stakeholders. Inherent interest to experiment, collaborate and create. Working knowledge of common customer experience metrics. Strong conceptualisation and visual communication abilities. Keen aesthetic sense and a strong eye for details. Strong grasp of prevailing UI/UX trends. Proficiency with design tools such as Photoshop. Two choices of role: sales development (inbound sales) and business development (outbound sales). Inbound sales: perform follow up (e.g. telesales) and potentially deal closing to all incoming leads. Outbound sales: perform end-to-end sales pipeline (i.e. lead generation, follow up, deal closing). Work with other teams to target the right market and deliver excellent user experience. Bachelor or equivalent degree is desirable. Excellent interpersonal and communication skill in English and Bahasa Indonesia. Passion and interest in online shopping and eCommerce industry. Flexibility to make short business trips as and when required. Naturally outgoing, hard working, and results oriented. Born in 1990s and a Bachelor Degree are desirable. 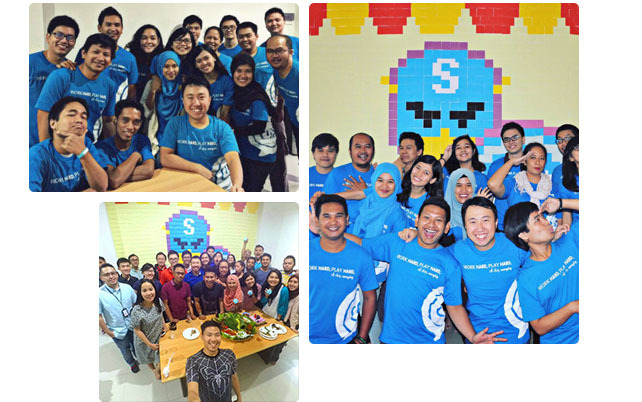 Based in Jakarta, Yogyakarta, Surabaya and Bandung. Liase with our Clients to get the most up-to-date Merchandising and product details to list online. Maintain product listing and prices in our CMS regularly. Liase with our Marketplace partners to get strategic and tactical supports for our Clients. Plan, schedule and execute marketing campaigns in online marketplaces. Produce and present monthly reports to Clients in conjunction with our Business Development team. Building strong trusted/strategic advisory relationships with our key users, anticipating their needs and helping them use our products and services to make their businesses more effective and successful. Identify and profile specific group of users. Provide insights report to management for improvement consideration. BA/BS or equivalent in Business Administration/Statistics/Information System. At least 3 years of experience as a senior level Account Management or Key Account or similar position. Excellent communication skills in Bahasa Indonesia and English. Performed well in high initiative positions. A tech savvy who love to learn and adopt different technologies. Able to quickly adjust to new conditions. Updated with the latest local brands trends. Own or aspire to start an online store is a major plus. On-boarding and partner with our customers, helping to ensure that they’re up and running on our platform. Engage new users by providing consultation to help them incorporate their websites to the business. Identify specific requirements and capture the opportunity to up-sell. Manage the complications during onboarding period and escalate to related team when necessary. Provide insights on our new users behavior to the management based on the feedback through the onboarding process. Collaborate with Content Development to develop highly effective guideline and training materials. Analyze new users website performance periodically. BA/BS or equivalent with minimum GPA 3.00 (out of 4.00). At least 1 year of experience in Key Account/User Success position. Passionate about helping local brands to grow and up to date with e-commerce overview. Familiar with website content management system (CMS). Collaborate with Marketing, PR and Customer Experience to develop a variety of content marketing materials. Interpret creative direction and adapt points from creative briefs into persuasive copy concept. Demonstrated success in managing a business social media presence. Memproses order yang masuk ke dalam sistem marketplace. Minimal SMA / S1 Segala Jurusan. Siap bekerja secara shifting 09.00 - 18.00 dan 13.00 - 22.00. Collaborate with marketing teammates to support our paid marketing materials (Facebook Ads, Google Ads, and more) and content marketing (blog, social media assets, and more). Expert in Final Cut or other video and motion graphic software is a plus. We require work samples to apply for this position.